UMBC and the Universidad de Piura (UDEP) signed a new academic agreement on June 30, 2017, representing the first such partnership between UMBC and an institution of higher education in Peru. 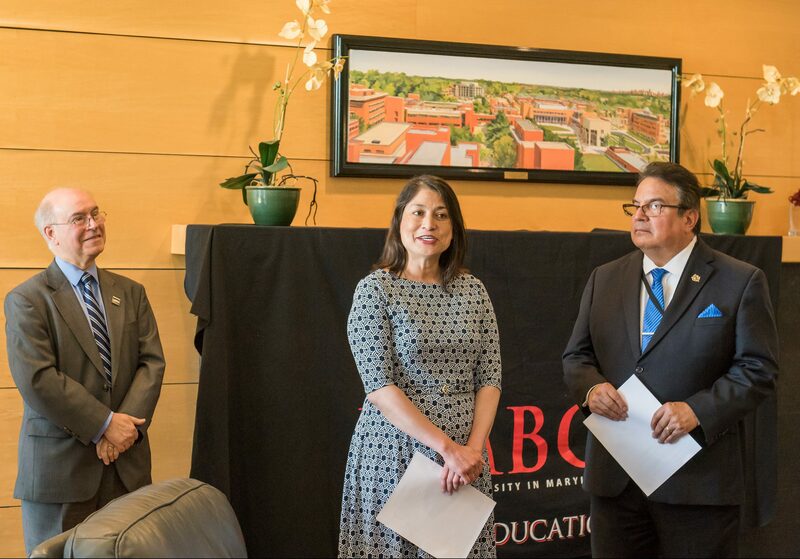 This agreement formalizes emerging collaborations between UMBC’s master’s program for teaching English as a second language (TESOL) and UDEP’s Centro de Idiomas (Language Center). The two universities seek to share TESOL methodologies and best practices, and to benefit from opportunities for cross-cultural exchange. 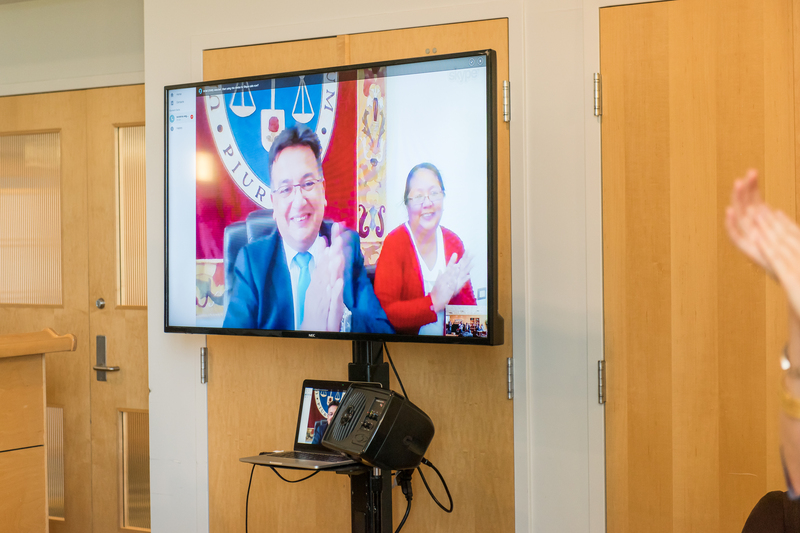 The agreement enables UMBC TESOL students and alumni to provide English language instruction at UDEP, while improving their Spanish language skills and knowledge of Latin American culture. It also outlines plans for visiting scholars to present academic talks or organize international symposia at each of the partner institutions. Antonio Moreira, vice provost for academic affairs, signed the agreement on behalf of UMBC in UMBC’s Fireside Lounge and UDEP Rector Sergio Antonio Balarezo Saldaña participated by live video feed. Balarezo Saldaña (l) and Moreira (r) greet one another ahead of the signing, with Schwartz providing translation support. Jonathan Singer, associate professor and chair of education; Doaa Rashed, M.A. ’08, TESOL, TESOL director and Ph.D. candidate in language, literacy, and culture; and Mary Tabaa, TESOL instructor, also attended on behalf of UMBC. Additional witnesses included Maryland Deputy Secretary of State Luis E. Borunda; Mary Nitsch, M.A. ’99, TESOL, director of international affairs for the Maryland Office of the Secretary of State; Consul General of Peru in Washington, D.C. Ana Cecilia Gervasi (who has since become consul general in Toronto, Canada); and Susana Vegas, director of international relations for UDEP, as well as Madelaine Pella Schwartz, M.A. ’10, TESOL, chair of the Maryland–Piura Sister State partnership‘s Education Committee. Gervasi (center) provides remarks on behalf of the Peruvian consulate, as Moreira (l) and Borunda (r) look on. “For us this is a very special moment, because this is the first palpable result of collaborations we have started with the state of Maryland…through a sister state partnership,” said Gervasi. Balarezo Saldaña celebrates the signing via Skype. Indeed, for Moreira, one of the deep similarities between UMBC and UDEP is how embedded each university is in its home community. Moreira described the new agreement as not just an exciting collaboration in and of itself, but also as the first building block in a new relationship that could expand to include programs from environmental science to engineering. Moreira (front) signs the partnership agreement on behalf of UMBC, joined by Gervasi, Borunda and Singer (l-r). Additional coverage of the signing ceremony is available through UDEP and the Ministerio de Relaciones Exteriores of Peru. Featured image includes UMBC’s Tony Moreira (center), surrounded by partnership organizers and honored guests from the U.S. and Peru. Photos by Marlayna Demond ’11 for UMBC.